George Lawyers Brisbane offer trusted professional advice on personal legal matters, small and medium business law, and transaction of real properties. When it comes to personal matters, taking the next step and contacting a lawyer can be a daunting experience! From Family Matters to Wills and Estate Planning, the George Lawyers team will do our very best to make sure you feel comfortable every step of the way. If you’re in business, you’ll be pleased to know that George Lawyers also specialise in Commercial Law and Conveyancing. When dealing with issues pertaining to your business - your bread and butter - we’ll make sure we protect your interests above all else. Principal of George Lawyers, Rod George has many years’ experience in law. In Commercial Law, he has worked in advising small business sales and acquisitions, commercial and residential property sales and acquisitions, company and trust setups, franchises, commercial leasing (landlord & tenant), business restructures, business succession and asset protection planning. He also has extensive knowledge in family law; including property and children. As well as, wills and estates including testamentary trust setups. When in need of legal advice or legal help, Rod and his team are the best choice! 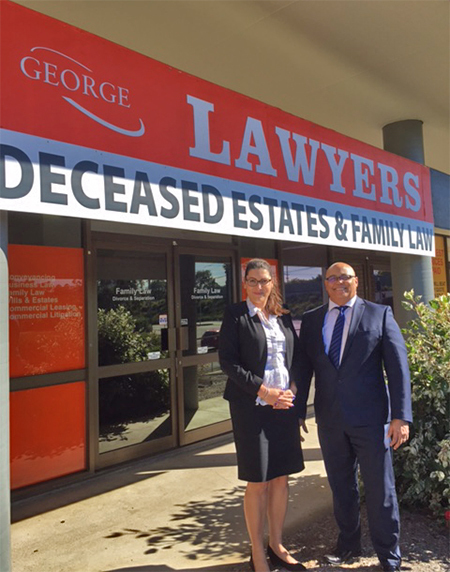 George Lawyers has two office locations; one in Browns Plains for the easy access of local residents and businesses in the Jimboomba, Regents Park, Hillcrest, Marsden and Sunnybank Hills areas, and the other in Newstead (Gasworks), serving Brisbane’s Inner City and Northern Suburbs. At George Lawyers, we treat our clients with respect and explain legal matters in plain English. We protect our client’s interest above all else. ©2017 George Lawyers. All Rights Reserved.